A burn can be one of the most painful type of injuries. Burns are generally classified into 4 degrees of severity with 4th degree being the most severe. First degree burns are the least serious category of burns. A first degree burn involves damage only the outer, superficial layer of the skin. First degree burns are comparable to a sun burn and usually involve redness, dryness and sometimes swelling of the skin. The affected are may be painful to the touch but there are no blisters on the skin. Most first degree burns eventually heal completely. A second degree burn occurs where the damage extends past the superficial outermost layer of the skin and goes deeper into the underneath layer of the skin called the dermis. Second degree burns leave the affected area of skin bright red and swollen. The burned skin often has a wet or shiny appearance and blisters will also appear. Second degree burns may or may not completely heal depending on how deep the damage is. With a relatively shallow second degree burn, only the upper part of the dermis layer is damaged. This usually allows full recovery with no permanent scar tissue. With more severe second degree burns the damage extends deeper into the dermis layer and results in permanent scarring or skin discoloration. A third degree burn classification applies when both the outer and underneath (dermis) skin layers are completely damaged. This is sometimes referred to as a "full thickness burn." Third degree burns typically turn the damaged skin area black, brown or yellow. Instead of appearing wet like a second degree burn, the damaged skin is dry to the touch and leathery in appearance. Third degree burns also destroy nerve endings in the area so the burn is typically not painful to the touch in the center. Third degree burns are very serious injuries that should be treated in a hospital immediately. Third degree burns can be caused by the following: scalding liquid; flames from a fire and an electrical or chemical source. 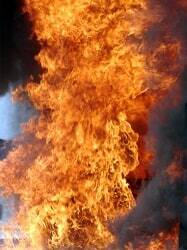 The most severe and harmful burns are classified as fourth degree burns. Fourth degree burns involve damage that goes beyond both layers of the skin and into the subcutaneous tissue. Some fourth degree burns even involve damage to the underlying fascia, muscles and bones. Burns of the fourth degree almost always leave the damaged area completely black and charred in appearance. Even when confined to a small area of the body, fourth degree burns can be life threatening injuries. Burns of this depth and severity can release deadly toxins into the bloodstream. Fourth degree burns on limbs or extremities will almost always require immediate amputation. If you were burned in an accident or as the direct result of someone else's negligence, you may be entitled to compensation for your injury. Lawsuits involving burn injuries can arise out of a number of contexts such as workplace accidents; serious car accidents; etc. The amount of monetary compensation you may be entitled to will typically depend on the nature and severity of your burn injury. A first degree burn is a very minor injury. Most first degree burns are analogous to a sunburn so it's not surprising that we don't find many reported settlements or verdicts based on first degree burns. Bradley v. Timko (2013 Maryland): In this case the Plaintiff was in a car accident and alleged, among other injuries, that deployment of the airbag caused first degree burns to his hands. The jury awarded $7,700 in damages for the first degree burns. Marshall, Pro Ami v. Battle (2001 Maryland): 5 year old incurred second degree burns to 5% of his body from water in shower that was too hot. Lawsuit was brought against the landlord and claims were settled for $4,000. Pasina v. ACG Texas Holdings LLC (2017 Texas): Plaintiff suffered second degree burn on her fingers from overly hot syrup at an IHOP restaurant. The claims were settled for $7,000. Ramirez v. Westwind Development Inc. (2017 Texas): Improperly installed gas valve for dryer resulted in an explosion causing second degree burns to 20% of Plaintiff's body. The burns permanently scarred his face. He also injured his hip and back and had to undergo surgery. A jury awarded damages of $6.9 million. D'Antoni v. Empire Medicine: Plaintiff incurred second degree burns to her stomach as a result of thermotherapy done at rehab facility. Jury awarded damages of $26,000. Nguyen v. Vinh Hung Enterprise Inc (2018 Pennsylvania): Plaintiff suffered third degree burns to his face, neck, hands and arms with permanent scarring from explosion caused by defective spark switch on gas stove. Jury awarded damages of $9.3 million. Brown v. City of Chicago (2018 Illinois): Plaintiff received third degree burns to the side of her head, neck and shoulders from accident involving police car. Jury awarded her $530,000 in damages. Estes v. Sanders (2017 Texas): Plaintiff was involved in car accident that caused third degree burns. Claims were settled for $90,000. Dryer v. City Lanes LLC (2015 New York): Firefighter's safety alert system was defective and the alarm failed to go off. As a result he suffered third and fourth degree burns to various parts of his body. The fourth degree burns necessitated amputation of his right arm. Jury awarded damages of $10.5 million. Jentz v. ConAgra Foods Inc., (2012 Illinois) Third and fourth degree burns were disfigurement, scarring and permanent disability resulted from explosion. Plaintiff was awarded damages of $75 million. If you or someone you know might have a lawsuit involving burn injuries, contact the personal injury attorneys at Miller Zois for a free case evaluation. Call us at 1.800.553.8082 or submit a request for a free consultation.